SSC JE civil engineering previous year solved papers are for candidates who are priming for junior engineering. 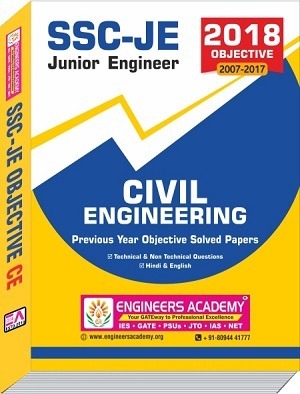 The SSC JE civil engineering previous year solved papers are very beneficial and provide you with an idea concerning the type of questions asked in the junior engineering (civil) exam. This Book is in English/ Hindi language for Diploma and Engineering Students and it’s a unique book for SSC JE and State Engineering Services Exams. However, in order to prepare for such an examination, you have two options- self-preparation or join a coaching center. Coaching like Engineers Academy is not only a destination for all career allied requisites of candidates, however, committed to pledging learning experience that would help the students to utilize their potential to attain success in all the competitive fields examinations.